Ah, that good ole can of cream of mushroom soup! Does it remind you of your mother and grandmother; used in beloved dishes like string bean casserole and the like. With its creamy blend of ingredients, it adds an unmistakably nostalgic taste to many dishes. When I get a dose of nostalgia, I’m brought back to my days growing up in Texas. I loved mushroom soup… from the can. 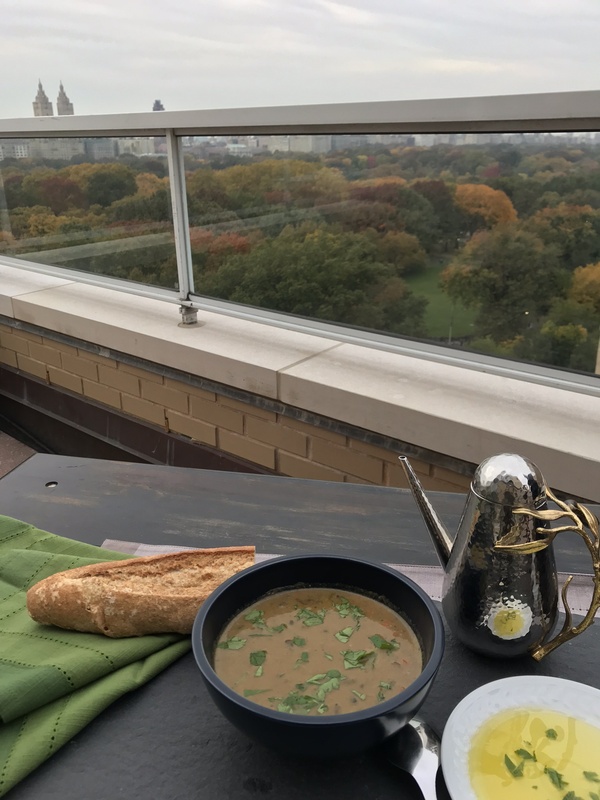 There’s a certain something about mushroom soup, don’t you think? It pulls you in and makes you want to never stop eating it. It’s instantly crave-able…that rich umami flavor and velvety texture. Reboots are everywhere these days, and this one is a crowd-pleaser. 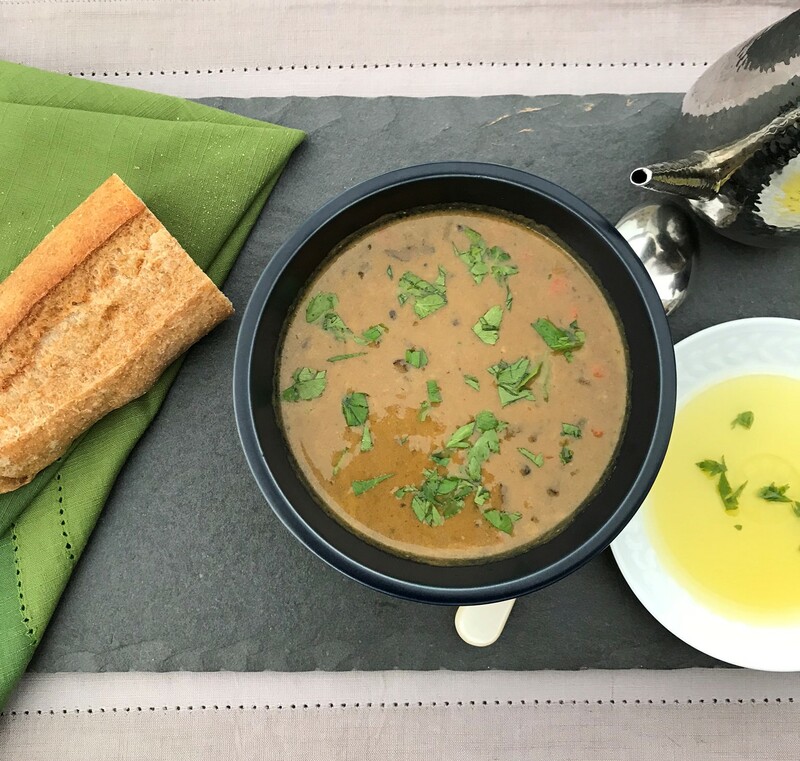 My wild mushroom soup will give you all the joys and memories of your childhood comfort dish with even fuller flavor and healthier benefits that come with using whole ingredients. No cans or can-openers required. I know a dish is a success when my husband likes it and Michael just can’t get enough of this soup. The meaty and unctuous mushrooms combined with salty goodness from layers of flavors make it irresistible. Whether you whip it up on a weeknight or make it the star of a Saturday night soiree, it’s guaranteed to be a hit with everyone who gets to enjoy it. So, leave the cans for your grandmother and make this soup. One of the upgrades of this dish is how we only blend half of the soup, which means you still get a great texture from the vegetables that make up the layers of flavor. It’s the perfect treat for these autumn nights. Don’t forget a nice crusty baguette for dipping! In a strainer under cold water, rinse the dried mushrooms. In a small saucepan, bring 2 cups of the chicken stock to a boil. Add the rinsed mushrooms, remove from the heat and let stand, stirring occasionally, until the liquid is cool and the mushrooms reconstituted. With a slotted spoon, remove the mushrooms from the liquid, pressing as much of the liquid out of them and back into the pan as possible; finely chop the mushrooms. Let the liquid settle, then pour off and reserve the clear portion; there should be about 1 1/2 cups. Discard the sandy residue. In a 5-quart pot over medium heat, melt the butter. Add the portobellos and 1 teaspoon salt. Cover and cook, stirring occasionally, until the mushrooms have rendered their juices, about 5 minutes. 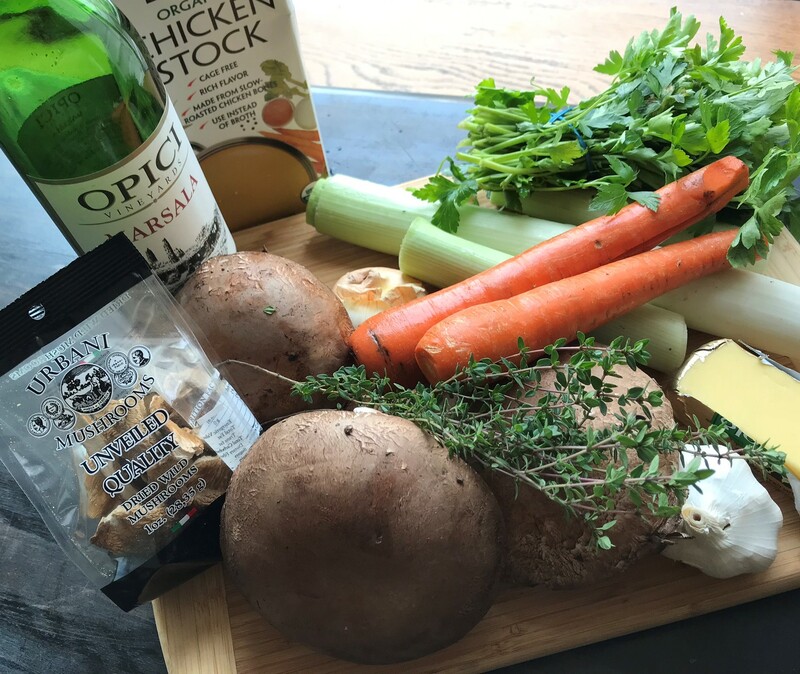 Add the chopped wild mushrooms, onion, carrot, leek, garlic, thyme, and bay leaf. Lower the heat, cover and cook, stirring occasionally, until the vegetables are becoming tender, about 10 minutes more. Sprinkle the flour over the vegetables are becoming tender, about 10 minutes more. Add the Madeira, raise the heat to high and cook, tossing and stirring often, until the liquid has evaporated, about 2 minutes. Stir in the remaining 4 cups of chicken stock, the reserved mushroom liquid and 1/2 teaspoon pepper. Bring to a simmer, partially cover and cook, stirring occasionally, until the vegetables are very tender and the soup has reduces to 6 cups, about 30 minutes. In a medium pot over low heat, bring the soup to a simmer. Stir in the parsley and adjust the seasoning. Serve hot.